Location: Main trailhead located in the Bike & Hike Park behind the St. Germain Chamber of Commerce at the intersection of Hwys 70 and 155. Parking is also available at the east end of the trail across from South Bay Road and at a lot on Old Hwy 70. 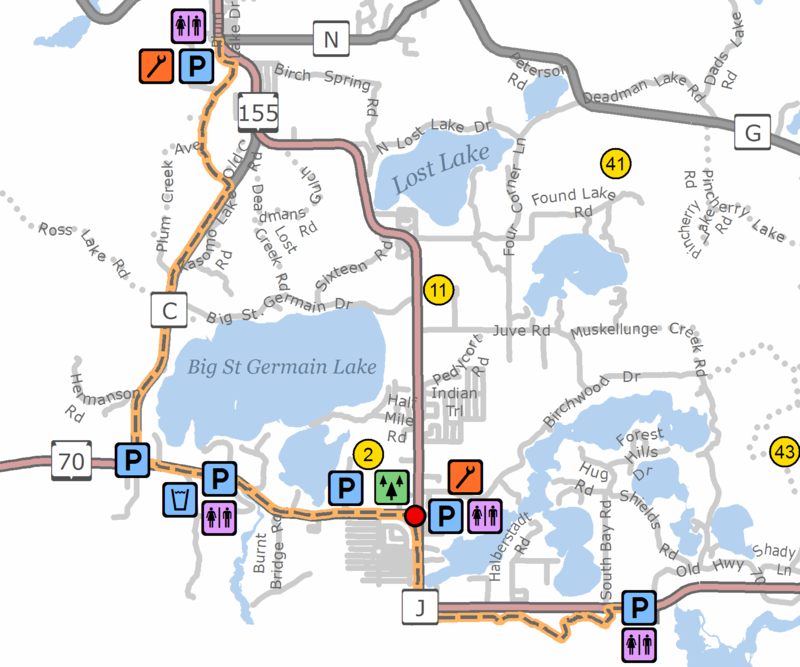 Part of the over 40-mile Heart of Vilas County paved bike/hike trail, this segment runs from Sayner south along County Highway C and east along Highway 70 to St. Germain past a wayside with a restroom and picnic area and Awassa Hiking area. Bike & Hike Park at the intersection of Highways 70 and 155 (behind the Chamber) provides easy access as the trail continues east along Highway 70 to a parking area at the intersection of Highway 70 and County Hwy P (old Hwy 70).